When coming up with the idea to grill a barbecue pizza for competition—I got the inspiration from a similiar pie I saw in Lucky Peach and thought, "How could this not do well with judges who love barbecue"—I broke down the entire pie and built it from the ground up. It probably would have been good enough to use a barbecue sauce as a base sauce, but I wanted to go deeper and made my own hybrid pizza/barbecue sauce from scratch. 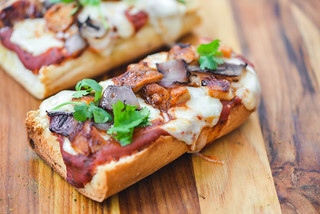 I basically approached it from a standard barbecue sauce recipe, but scaled back on ingredients like vinegar, molasses, and honey to give it a heavier tomato character with lighter hints of sweet and tangy barbecue flavor. Then for the meat, I thought smoked, pulled, and sauced chicken would be perfect. Of course, this meant I have to first rub down a set of chicken thighs, then smoke them until cooked through. After that there was a ten to fifteen minute cooling period until I was able to pull the meat from the bone, and finally the chicken was tossed with barbecue sauce and ready for pie placement. That represented almost an hour of work for one topping. That wasn't enough though, I felt like the pie needed more, and red onion seemed like the right addition. I could have simply thinly sliced these and thrown them on the pie, but instead I thought caramelized onions would only up my game. So I ventured forth, slowly cooking down a couple red onions until they were completely soft, brown, and delicious. Finally, after about two hours of prep, came the time to actually grill this sucker. I used my trusty approach to grilling pizzas, which began with cooking an oiled dough over direct high heat until the underside browned and crisped nicely. Then the dough was removed, flipped, and the toppings were applied to the cooked side. To further the barbecue characteristics of this pie, I went in with a mix of both regular and smoked mozzarella to add a smoky character. At the competition, topping the pizza took longer than normal, as I needed to ensure every piece would have a sufficient amount of each of those painstakingly prepped toppings. The pie then went back on the grill, this time over indirect heat, covered, and let cook until the cheese had melted and the second side of the dough was cooked through and browned. A sprinkling of roughly chopped cilantro then finished the pizza. And here's what was turned into the judges. 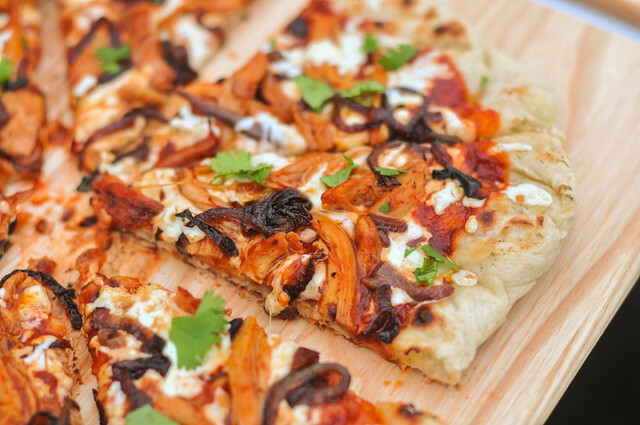 I was bursting with pride on this—the dough was crisp and light and the flavor of the toppings were spot on, having a present, but not overpowering barbecue character that paired well with the meaty chunks of chicken, sweet onions, and fresh cilantro. I was sure all the thought and time that went into this was going to pay of, and in a way it did since we got a call for 6th place in the pizza category, but it more real way it didn't, as I came home with no trophy or money for this endeavor. I'm using this pizza as a cautious tale, and approaching my upcoming grilling competition with dishes that require less work and may be more universally appealing. Who knows if I'm selling myself short going this new direction, but all I can do is venture forth, fingers crossed, and keep learning from each success and failure. 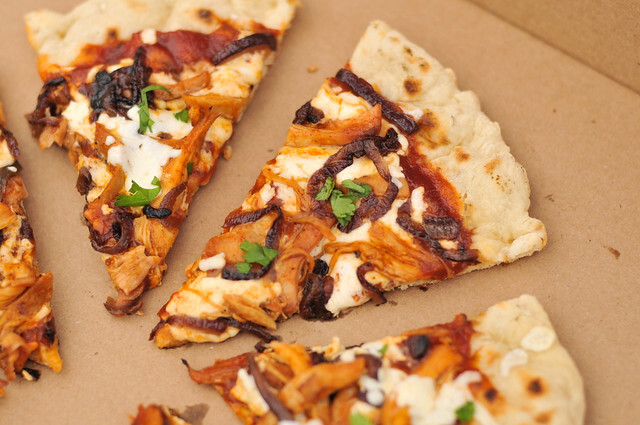 Barbecue sauce, smoked chicken, caramelized onion, and cilantro come together to make one might tasty grilled pizza. To make the dough: In the bowl of an electric mixer, whisk together flour, salt, and yeast. Add in oil and water and mix on low speed with paddle attachment until combined. Switch to dough hook and knead on medium speed until dough clears sides, but sticks to the bottom of the bowl, 5 to 7 minutes. Turn dough out onto lightly floured surface and divide into 4 equal pieces. Transfer to a parchment paper lined baking sheet, brush lightly with olive oil, cover with plastic wrap, and place in refrigerator for at least 1 day and up to 3. 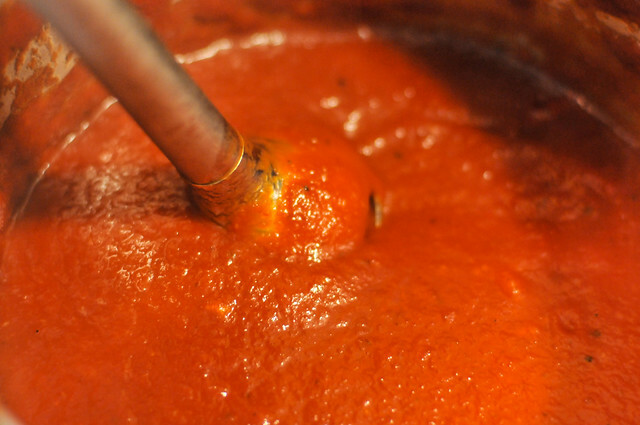 To make the pizza sauce: Heat oil in a medium saucepan over medium heat until shimmering. Add onion and cook until softened, about 5 minutes. Stir in garlic and red pepper flakes and cook until fragrant, about 30 seconds. Stir in tomato sauce, brown sugar, tomato paste, honey, cider vinegar, molasses, mustard, Worcestershire sauce, and oregano. Bring to a boil, then reduce heat to low and simmer until slightly thickened, about 20 minutes, stirring occasionally. Using an immersion blender, or transferring to a regular blender, puree sauce until smooth. Use on pizza the same day, or transfer to a jar and store in refrigerator for up to two weeks. To make the pizza: Melt butter in a medium skillet over medium-high heat. 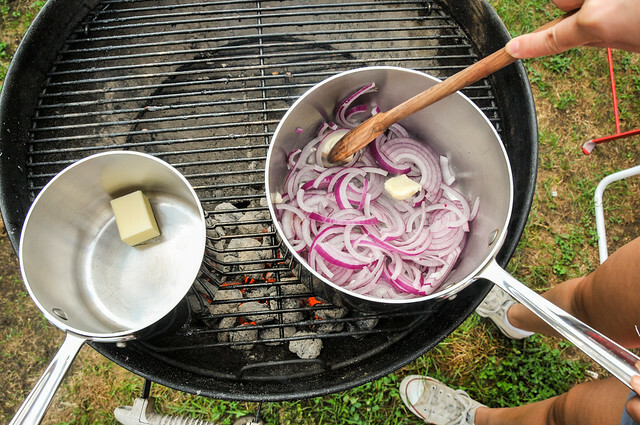 When foaming subsides, add onions and cook until completely softened and browned, about 10 minutes. Remove from heat and set aside. Light one chimney full of charcoal. When all the charcoal is lit and covered with gray ash, pour out and arrange the coals on one side of the charcoal grate. Set cooking grate in place, cover grill and allow to preheat for 5 minutes. Clean and oil the grilling grate. 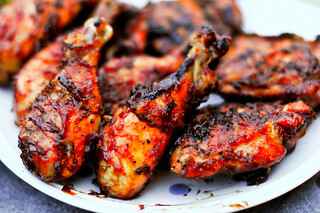 Rub chicken thighs all over with barbecue rub. 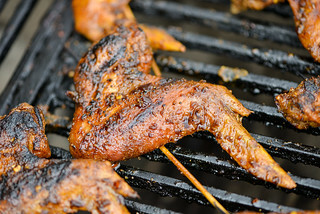 Place on cool side of grill, cover, and cook until meat registers 165 degrees on an instant read thermometer inserted into the thickest part of thigh, 15 to 25 minutes. 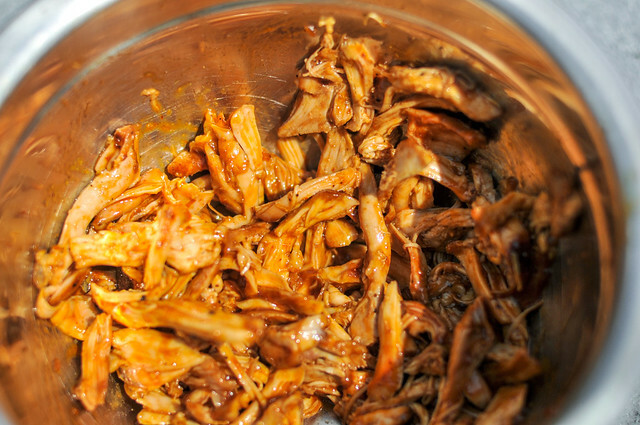 Remove from grill, let rest until cool enough to handle, then pull chicken meat into a medium bowl. Discard bones. Toss chicken with barbecue sauce. Replenish grill with one chimney of lit coals, arranged on one side of the charcoal grate. 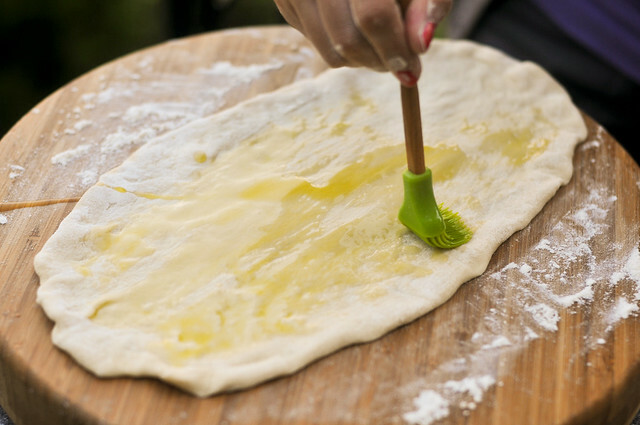 Stretch dough out to a long oval or rectangle on a surface dusted with flour. Lightly brush dough with extra-virgin olive oil and place on hot side of grill, oiled side down. Cook until bottom is browned and crisp and top side starts to bubble, 1-2 minutes. Remove dough to plate, cooked side up. 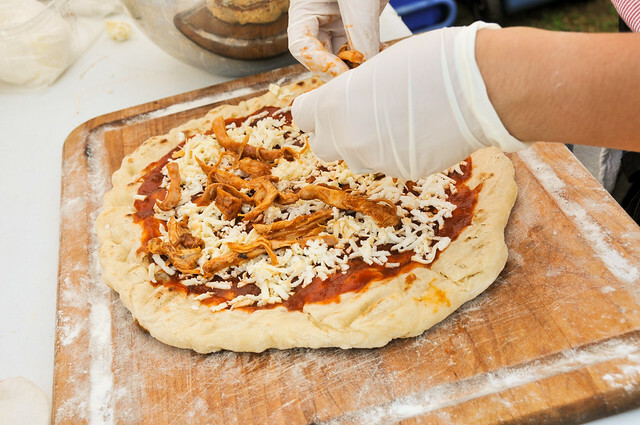 Spread dough with 1/4 cup of barbecue pizza sauce. 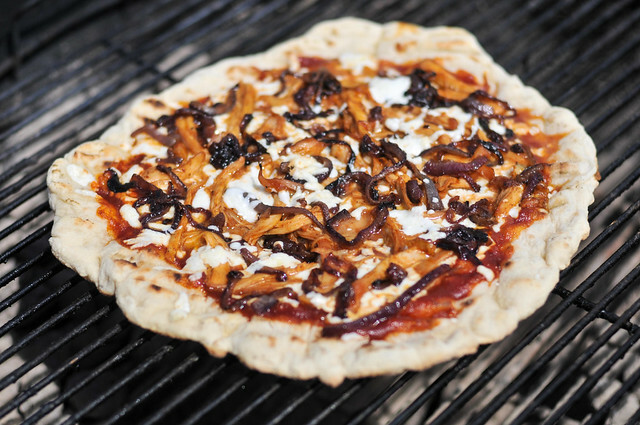 Top with 1/4 each of fresh mozzarella, smoked mozzarella, onions, and pulled chicken. Place pizza on cool side of grill and cover. Cook until cheese is melted and dough is cooked through, 4 to 7 minutes. If bottom crust needs better browning, finish cooking over hotter side of grill as necessary. Remove from grill and sprinkle with cilantro. Serve immediately. Repeat with remaining dough and toppings, there should be enough for up to four 12-inch pies. This looks delicious ... can't believe it didn't fare better with the judges. Always interesting to know what else was on your table and what actually won! @Amy Mills Will never know what was on the table, but the winning pizza looked like an overloaded mess of ingredients to me, but I guess looks were deceiving. The top pie was cooked on a stone though instead of grilled pizza style. As a new judge, I had the most difficult time judging the ancillary categories like this. At least with the standard 4 categories, I have a great deal of experience with them that gives me a good frame of reference.